This insightful and profound statement is coming from this soon-to-be eighteen-year-old lovely, trilingual, beautiful and wonderful young lady who just happens to have Trisomy 21 (Down syndrome)—Arianna Dinwoodie-Palmes. Arianna lives in Barcelona, Spain. She reads and speaks fluent Catalan, Spanish and English. She attends a school where classes are taught in Catalan and Spanish. She learned English from her dad, who is from the United States. She takes a theater class once a week with “typical” kids, personally takes care of enrolling in the course every three months and pays for all her classes. She also does gymnastics with kids who have some learning challenges. She lives in an inclusive world. She navigates the very big, chaotic city of Barcelona on her own, taking public transportation to and from school while meeting with friends for movies, lunch and other social events. She loves Zumba, singing and doing research projects on the Internet and is very concerned about ecology and pollution. She is finishing high school this year and is looking forward to trade school next year, focusing on administration, sales and customer service. She is a happy, caring, typical teenager, who also happens to have Trisomy 21 (Down syndrome). The video (see above) was Arianna’s idea and she wrote her own scripts. These are her unedited thoughts and words—in three languages! Arianna’s level of function makes her normal. Arianna’s insight, personality, smile and overall goodness make her exceptional—exceptionally wonderful! Such a simple, obvious, but profound statement, particularly when viewed in light of the still staggering numbers of fetuses identified as having Down syndrome that are aborted. Recent research states that in the U.S. there is a termination rate of 67% of fetuses following a prenatal diagnosis of DS. None of us are, none us will ever be and none of us need to be perfect. Somehow our enlightened, educated and politically-correct society has created and perpetuated the myth that some of us are not miracles of creation, that we do not have limitless potential and thus are condemned by myopic prejudice to be deprived of the right to live; or are often condemned by perceptions of limited potential and given limited “appropriate” opportunities that are commensurate with the perceptions. After all, isn’t being less than perfect what defines us as being human? This entry was posted in Challenging the Status Quo, Human Potential, NACD Families and tagged child development, down syndrome, functioning, kids, language, potential, spain, special needs, trisomy 21 on January 18, 2017 by Bob Doman. I have spent this week in Barcelona, lecturing on developing cognitive function in children with Down syndrome, seeing some great families, and getting to know this new Barcelona. I traveled here and actually lived here for almost a year back in the seventies. It is incredible how much has changed in forty years. The city has grown tremendously, added a lot of new modern buildings, dramatically resurrected their port area, and really changed the complexion of the city. Since hosting the Olympics in 1992, the city has become much more diverse in its population and has become a favorite of tourists. Part of the dramatic change in Barcelona that I was delighted to see is a change in the perception of special needs children. They have come a long, long way from where they were when I was working with children here in the ‘70s. It’s hard to believe when looking at the progressive open mindedness of the educators, therapists, and physicians today that forty years ago special needs children were often referred to by the professionals as “los animales” — the animals. In the ‘70s I left in frustration; but now I’m looking forward to working with both the families and professionals here again. Today I had a rare day–I actually took the day off before heading to London tomorrow morning and at the insistence of my son, Laird, and his fiancée, Sadie, we went to visit what is truly one of the architectural wonders of the world, the Sagrada Família. The Sagrada Família is a church which began being built in 1882 and was taken over in 1883 by the architect Antoni Gaudí. Gaudí created a design and concept that has led to an ongoing project that will probably not be completed until the first third of the 21st century. Gaudí was inspired by nature and used his understanding and appreciation of nature to guide his work in this incredible, virtually organic building. We walked around and through this church and looked at literally thousands of amazing design and structural details and more thousands of ornamental details, many of which depicted animals, plants, and people. As you look at it, particularly from the interior, you almost expect it to take a deep breath and come to life. Tending to never get more than a few heartbeats away from my passion, kids, I was compelled to make an association between this incredible building and a child. It is very easy to get lost in all of the amazing pieces of this building, from the great turtles supporting some of the exterior pillars, to the vines and leaves and creatures you discover everywhere, to the magnificent pillars supporting the structure of the church that resemble trees and branches. But if you get lost in the pieces, you miss the amazing aggregate of this totally unique building. I couldn’t help but think about how easy it is to also get lost in a child’s pieces, to see how parents, but more often teachers, therapists, and physicians, can become so focused on some of those pieces and often not see the magnificent totality of the individual. All of us, parents and professionals alike, must always look at the whole child first, the truly unique child, and not get lost in their pieces. Yes, we need to address problems and examine issues; but first see the child. If we don’t, we will never properly address their problems, and we will never help that child to become who they are. We cannot look at a child as a collection of pieces and do them justice. We need to work with them from the top down. See them as the people they are, and from that foundation then address their pieces. 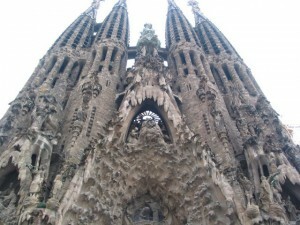 And, just like the Sagrada Família, our children are all a work in progress. Somewhere along the way the professionals in Spain started actually looking at all of the children and seeing a child. This entry was posted in Spontaneous Thoughts and tagged barcelona, child development, kids, spain on May 8, 2013 by Bob Doman.